11x14 #SemperToons Matted Prints. Artwork by GySgt Charles Wolf. Design features a Marine saying to his dog, "Since when do I have to bang on your dog hatch 3 times to go for a walk?" Design features the "recruiting techniques" of each branch of the service. Design features a senior Marine making fun of an "03" saying, "Hah! You're an 03, Alright I bet you've been in the field for about Ohhh, 3 hours so far!" Design features a Marine saying "I have led thousands of Marines, commanded entire units into battle, given orders that have stopped navy fleets...But, as soon as I get home, I can't event tell the dog what to do!" This design features a teddy bear stuffed animal in a Marine Corps Dress Blue Uniform. Design features a coversation between the first two Marines ever to enlist in 1775. Design features a Marine with a devil Marine and an angel Marine on each shoulder. Design features low-angle view of Marines standing in front of the American flag on the left with hands gripping the Marine flag on the right. Text "SEMPER FIDELIS" is featured in white script font on the bottom of the image. Design features one Marine saying "Come on, what did the First Sgt Say?" to another Marine. Design features a D.I. yelling at a Marine recruit the words, " I HEARD YOUR EYEBALLS MOVE!". Design features a cartoon funny moment of miscommunication between a Marine and a Platoon leader while at battle. Design features a comical scene between a Marine recruit and an E900 in the morning. Marine recruit asks E900 how his breakfast was, and E900 responds with, "I'll tell ya what I had for breakfast, Mr. 20 Questions...". Design features a cartoon with text "LATE!? ?..Well, Huh would you believe three flat tires?" This design features a 4 panel cartoon joking about a Marines skin care regiment. Design features a cartoon of a SGT finding a lamp with a genie that grants one wish each to a SGT, SSGT, and Gunny. Design features a male or female Marine standing in salute facing the American flag. On top of the image sit the words, "For Honor, For Country". On the bottom are the words, "Honor", "Courage", and "Commitment". This design features a Marine competing against Spider Man in an obstacle course. Design reads, "After the cease fire, I think you better come down about 40 clicks!!" Design features an Admin Marine with the text, "Good initiative, bad judgement Marine!" Design features "At ease Superman! You may be bullet proof... But there is no way you're GRUNT PROOF!!!" Design features a bus hitting a Marine guard at Parris Island. Three Marines at a Marine Corps-style ATM. Words state, "It says...Transaction not completed: Please try to get your nasty body on the yellow foot prints, quit eyeballin' the freak'n camera, and go get a hair cut...Have a nice day." Design features a cartoon scene featuring Noah's Ark from the Bible arriving on a beach. Noah's son points to the bulldogs on the beach and says to Noah, "There's the signal, Father!! The bulldogs have landed and secured the beach for us!!" Design features a Marine with severe helmet hair after taking off their combat helmet. Design features a baby with the text "Marine Kid. The Few. The Loud." Design features a baby saying "OOH WHAA" a play on the Marine's "OOH RAH"
Design features a comical scene between two Marines playing paintball while hiding behind barriers, and claiming who shot who first. Design features a DI yelling "YOU CAN'T HANDLE THE TRUTH"
Design features a cartoon of a Battery in the Field. Design features a cartoon scenario where one Marine is mocking two others who are playing instruments. In the next panel, the two Marines with instruments fire back at their mocker by shooting knives out of their instruments, sending him off running. Design features four panels. The first states, "Three Times to Worry the Most". The second panel says, "1st Lieutenant: It has been my experience...". The third panel says, "Captain: Trust me!". Finally, the fourth panel says, "Major: Watch this!". Design features a comical reverse rendition of the Boogie Man story, with the Boogie Man himself asking his mom to check his closet for Marines. Design features famous Iwo Jima image with quote by GySgt Charles J. Wolf Jr., "To observe a Marine is inspirational. To be a Marine is exceptional." Features a cartoon scenario in front of an Army and a Marine recruiting office. The ad for the Army office reads, "Join Today To Become Army Strong For The Next Four Years", while the Marine ad reads, "...Or Join The Marines And Be Tough Forever!" A cartoon of three new dads in a hospital nursery, two newborns are in standard hospital cribs, while the middle is in a tent. New dad on the right says to the Marine dad, "Wow! Marines really are born into it! 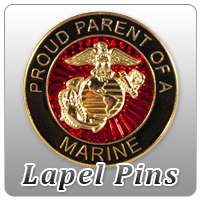 ", as the Marine dad proudly smiles. Design features the Marine flag whipping in the wind, along with quote on top by GySgt Charles J. Wolf Jr.
Design features a plane with two Marines inside, one commenting to the other, "Man...I bet our turbines cry freedom to those recruits every time we take off!" Features a Marine at his desk with various trophies and accolades on the wall. In the right corner is a Marine D.I. in gear and cap encased in glass. Above the case is a sign that says, "In case Marines forget who and what they are - BREAK GLASS - ". Design features a Marine with a lipstick kiss and the text "I Love My Marine". Design features a turtle mistaking a Marine's combat helmet for a turtle. Design features a comical situation of one Marine shouting to another off-screen, "Hey Gunny! Your coffee's done! ", as a demon rises from the cup, signifying just how dark the coffee is. Design postal carrier is in a gilly suit to deliver the mail and has even comouflaged his postal truck to look like an icecream truck while recruit mom scans the neighborhood for the mail truck and delivery. Design features a DI yelling at a kid through the tv. Design features a male Marine recruit writing a letter to his mother as his D.I. stands over his shoulder. The recruit writes, "Dear Mom, I have good news and bad news. The good news is I'm fine! The bad news is...I have a new mom!" Design features a cartoon situation in which two Marines notice another Marine with his head in the coffee pot, guzzling all the coffee. The female Marine off to the left says to the other, "Ohh yeah...It's definitely Monday!" Design features a Marine in full camo gear standing in an outdoor setting on the left. The words, "United States Marine Corps" sit on the right. Design shows Marines talking to eachother with "barks" while Sailors listen in and say "That my friend is devildog talk!" Design features a Marine shining a "Batman"-style light with the EGA telling the President (Bush), "Whenever You Need Us, We'll Be There"
This design features a Marine that is not scared of a snake or scorpion, but is scared of an Irish Pennant. Design features a child dressed in adult sized Marine D.I. camo gear and cap shouting at a teddy bear, "Get your eyeballs off of me!" Design features a superior Marine saying, "My pain is seeing the weakness in your body!" to a Marine trying to do a pull up. Design features new recruits sitting in front of their DIs that look like lions and a dinosaur. Design features a DI at the hospital after yelling at a recruit. Design reads "Remember, if it's from the waist up... Marines get Motrin, from the waist down..., Marines get Foot Powder!" Design features a drill instructor dreaming about recruits in training. This design has both a male and female option. Design features a female Marine writing to her mother as her D.I. stands a little ways off. She writes to her mother, "P.S. One more thing, Mom...tell Father I now know the answer to 'Who's my daddy"...and it's not him!" Design features a kid talking to a recruiter about why he should join the Marines. Design features a DI saying "Many have stood on the yellow foot prints... FEW have stepped off earning the title Marine!" Design features a DI yelling "Quit Eyeball'n Me!" _T-Shirt (Unisex): SemperToons - Coffee's Done! _T-Shirt (Unisex): SemperToons - I Got You First! _T-Shirt (Unisex): SemperToons - Recruit, What You Waiting For? _T-Shirt (Unisex): SemperToons - Why Join? _T-Shirt (Youth): SemperToons - Coffee's Done! _T-Shirt (Youth): SemperToons - I Got You First! _T-Shirt (Youth): SemperToons - Recruit, What You Waiting For? _T-Shirt (Youth): SemperToons - Why Join? _T-Shirt/Onesie (Toddler/Baby): SemperToons - Sembear Fur! Garden Flag (Made in USA): SemperToons - I Got You First! Garden Flag (Made in USA): SemperToons - Sembear Fur!